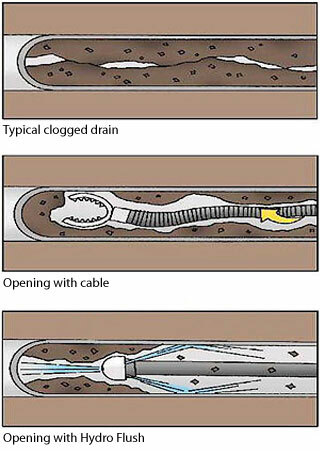 Hydro Flush service is the most effective method to restore most old drain lines to like-new condition. The Hydro Flush system forces water through tiny openings located in the nozzles. The combination of the high pressure and water volume provides a cleaning system unattainable by conventional methods. Unlike conventional cable methods, Hydro Flush services are designed to prevent future problems. While conventional machines are effective in opening a blockage, they do not clear the line of problems like grease, soap or sludge. Soft deposits left in the line collect pieces of paper or other material, eventually causing another blockage. Only the power of the Hydro Flush and the skill of your Hy-Pro technician can help avoid the expense of ruined wall and flooring from backed-up drain lines.